What will happen to Carillion pension savers? Some of Carillion’s workforce belong to a modern auto-enrolment ‘defined contribution’ pension plan run by BlackRock. These staff save into individual pension pots wholly owned by them, which won’t be affected by the firm’s demise. However, a further 28,000 people belong to Carillion’s 14 ‘final salary’ pension schemes, some 12,000 of whom are understood to have already retired. It is not yet clear if some of these schemes are attached to parts of the company which will survive the liquidation, or if all will eventually pass into the Pension Protection Fund. This is an automatic process when firms go bust, so savers don’t have to do anything. Final salary pensions, which are typically the most generous around, are meant to provide a guaranteed income until you die. Former Carillion members who have already officially retired will receive 100 per cent of what they were due, and the PPF will continue to issue their payments as normal, with no annual cap even for those on a very substantial income. HOW DO DEFINED CONTRIBUTION AND FINAL SALARY PENSIONS WORK? More generous gold-plated defined benefit – or final salary – pensions provide a guaranteed income after retirement until you die. Staff who retired early or are still working will get 90 per cent of what they were due, and this will be subject to an annual cap. This cap is set by the Government and is currently £38,505.61 for people aged 65 – or £34,655.05 after the 90 per cent level is applied. So the workers suffer, as usual? To a degree, yes. Although the PPF takes some of the sting out of an employer failing with a pension deficit, the terms are not as generous compared with the pensions many would have been expecting to receive. There is a cap on the annual pension the PPF is prepared to pay. Although this now rises after 21 years of pensionable service, and some might say it’s a generous £34,655 per annum, it still feels like robbery to those who thought they had secured more. Is it right that employees, current and past, should essentially bail out a company who has failed to fund its pensions? Of course, the PPF has to fund the deficit of nearly £600m, and perhaps up to £800m by the time the dust has settled, according to some estimates. In addition to assets of pension funds it receives and their returns, the PPF is funded by a levy on pension schemes. This means that the healthiest schemes bail out the least healthy schemes, which have failed. Clearly that irks those who believe they have managed their funds prudently. But it’s hard to think of another way of achieving the aims of the PPF without taxpayers’ money. Which in turn will irk those who pay taxes but have no pensions. In an article last year, ironically about de-risking pension liabilities, Carillion’s pension fund was stated as being 85% funded. With assets of £2.3bn and liabilities of £2.7bn, it had a deficit of £400m even then. Why did this not send alarm bells ringing? One reason might be that the valuation of the liabilities assumes that investments in the poor-returns of guaranteed government bonds are to be used to fund future pensions. In practice, pension funds hold riskier bonds with higher yields, and equities with statistically higher expected returns, making the future pensions more affordable. This all works perfectly well so long as the sponsor company remains solvent, and can meet any shortfalls nearer the time. Or, what happened in the 1980s and 1990s, returns were so good that companies took “pension holidays”, and chose not to contribute to their funds because they were so healthy. But while companies have unlimited upsides to their fortunes, they cannot survive insolvency. The question hanging in the air for me is: How can we say that Carillion was even remotely solvent when it had a near-£600m hole in its pension fund? 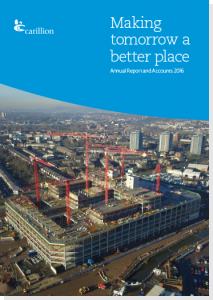 In its 2016 annual report, it reported a book value of £701m. Enough to cover the pension deficit. However since then, it cut the value it placed on contracts by a total of £845m while watching its debts rise. It struggled on, hoping for a £300m injection from banks, but they had had enough. With the pension deficit, Carillion was just about solvent based on 2016 figures. Could anything have been done sooner? Many are calling for there to be more regulator intervention in companies with respect to their pension funds. Carillion was criticised for paying dividends to shareholders while its pension remained underfunded. But there is already a body in place that regulates each pension. It’s called the board of trustees. It is the trustees, rather than the company, that are responsible for the pension fund. And if they choose to, they can close it down or take other action to protect the assets of pensioners. Perhaps the trustees of Carillion’s pension fund should have been brave enough to close the door, forcing Carillion to launch a new pension fund for its employees. Carillion might say in response that it was bailing out the fund by £50m per year. But clearly that wasn’t enough. I find it hard to accept that a company should be paying a dividend when its pension fund is only 85% funded. If trustees around the country aren’t up to the task of making brave decisions, I see a regulator being given powers to do that for them. The PPF is supposed to be a last resort, not an option. « No money, no passport, and a long way from home?